Shannon and Ian Rentsch have claimed a history-making sixth ‘King of the Desert’ title at the Tatts Finke Desert Race in Alice Springs today, grabbing the lead in the BFGoodrich CAMS Australian Off Road Championship (AORC) in the process. Rentsch dominated the event on his 16th attempt, leading from start to finish. The son-father duo started from pole position yesterday and set the fastest time from Alice Springs to Finke on day one, leading the event by three minutes at the halfway mark. The eight-time Australian Champions pushed their Jimco Aussie Special Pro Buggy all the way, extending their lead to claim the outright win by more than 16 minutes in a time of 3:36:37. 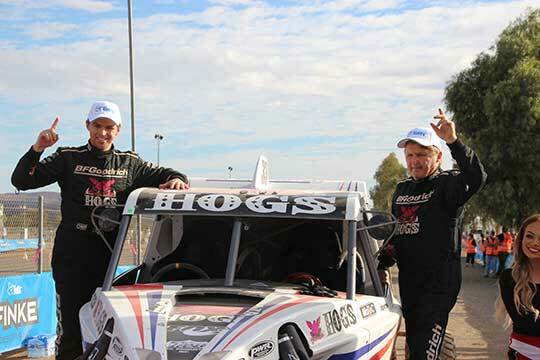 David Fellows, himself a five-time Finke Desert Race winner, and Mark Bergaminn was second across the line in the Geiser Bros Trophy Truck followed by 2016 Australians Off Road Champion Jack Rhodes and David Pullino in their Jimco Pro Buggy. Rentsch never looked like losing the lead but was well aware of a hard-charging Toby Price, starting three minutes behind him for the return leg from Finke. But Price failed to make the second checkpoint at Bundooma, retiring from the race after suffering a power steering pump failure and putting an end to his second Finke ‘Ironman’ Double attempt. “It’s awesome”, Rentsch said of his sixth Finke win after the race. “We’ve never won it from start to finish so to get the prologue, lead down to Finke and then back to Alice, it’s pretty special. “It’s probably up there with the best one we have done. Rentsch will now take a handy lead in the BFGoodrich CAMS AORC pointscore to the final round in Rainbow, Victoria. “That’s a bonus,” said Rentsch. Fellows was thrilled with his 2018 Finke Desert Race, particularly to have both Peter Kittle Motor Company entries making the podium. “It was a good weekend,” Fellows said. “We had a pretty clear run on the way down and on the way back and to get on the podium with both cars is a great result. Clearly, Fellows loves the event. Rhodes was happy claim third after a less than perfect weekend, rolling his buggy in prologue and starting down the order for the run to Finke. Talbot Cox and Andrew North were impressive in their Racer Engineering Carbon Series Toyota to cross the line in fourth and Michael Marson and Chris Colbourne rounded out the top five. in Victoria on 10–12 August 2018 for the third and final round of the year.